This weekend kicks off the unofficial start of the summer season here at the Jersey shore (cue angels singing!). After what seemed like a never ending winter, I couldn't be happier that summer is on our doorstep. The weather forecast for this weekend is near-perfect, and I must say, we deserve it. So, I'm planning to get outside and enjoy it! Here's what else I'm up to this weekend. Ever since Sirius introduced their limited-run Fleetwood Mac station (channel 30, if you're interested), I've been spiraling into a FM obsession. There's probably no other band that has released music in almost every decade of my life than Fleetwood Mac. There's music from the 70s, 80s, 90s. 00s, etc. I can listen to almost any of their songs and attach it to a specific decade/experience in my life. I've also gone down the rabbit hole of Googling all sorts of FM-related information. I came across this cover of "The Chain" by Harry Styles, and I literally can't stop listening. Ever since last weekend's royal wedding, I've been obsessed with all things British royalty. I had already watched The Crown on Netflix, and I'm glad I did. It helped prepare me and give me a crash course in the history of the royal family prior to the wedding. This piece in The New York Times is a must-read whether you are royally obsessed or not. It gives you an idea of just how impactful this marriage is going to be for the British monarchy. Also, if you want a better understanding of how succession to the throne works, this article does a great job explaining it. Where are my fellow Star Wars fans? This Friday, May 25, Solo: A Star Wars Story hits theaters. It's the story of young Han Solo and his daring escapades, how he meets his future co-pilot Chewbacca, and his early encounters with young Lando Calrissian. I've read mixed reviews, but as a true Star Wars fan, I'll be there! What's a holiday weekend without a little something festive? Whether it's a decoration or a dessert, you've got to celebrate Memorial Day weekend with a little red, white, and blue. I prefer to do it with a dessert, but hey, that's just me. 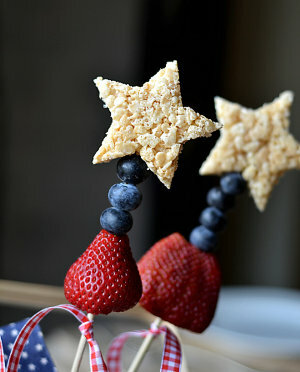 These Rice Krispies treat sparklers are super easy to make and are perfect if you are heading to a party or barbecue or even just staying put.